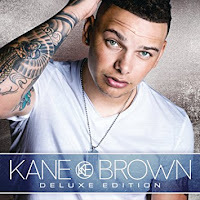 Kane Brown looks to have crossover potential. What Ifs was his first number one country hit and it crossed over to pop. He was born Oct. 21, 1993 in Chattanooga, TN. His father is black and his mom is white. He moved around a lot with his mom. He knew Lauren Alaina in high school when both were in the high school choir. So when she finished second on American Idol, Brown auditioned for that and X-Factor. He left X-Factor when they wanted to put him in a group. Then he started posting country music covers on Facebook. That got him a manager. Then he used Kickstarter to finance an EP. RCA Nashville signed Brown in Jan. 2016. They rereleased his EP and then released a second EP in March. After two singles were top 20 country hits, he recorded his debut album with producer Dann Huff. Huff is best known for producing Rascal Flatts. He's also a session guitarist. What Ifs topped the Country Singles chart and reached #26 on the Billboard Hot 100. Brown wrote What Ifs with Jordan Schmidt and Matt McGinn. Schmidt is under contract to Florida Georgia Line. I think this is the first big hit for both guys. Brown co-wrote most of the songs on the album. RCA just released a deluxe edition of Kane Brown with four bonus tracks. It looks like Brown will be on tour for most of 2018. And then I expect him to record a new CD. He's off to a good start. Here's the video for What Ifs by Kane Brown featuring Lauren Alaina.